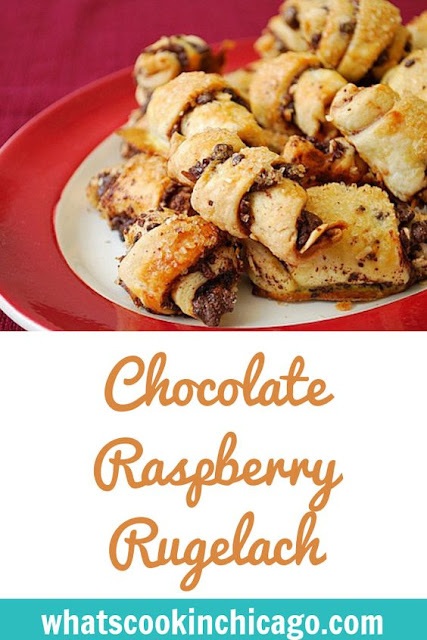 Article first published as Chocolate Raspberry Rugelach on Blogcritics. So, back to our love story. He says he loves to bake and his specialty is rugelach. I was floored and was anxious to bake together to see how his rugelach making skills. Well, needless to say, when we got in the kitchen, he confessed that he didn't really know how to make rugelach. Apparently, the truth was that when he was in high school, he worked part time at a small bakery and helped out as needed. One of his jobs was to help the bakers with the rugelach, their specialty item. At that point, I was already smitten by him so it didn't matter. Ever since then, rugelach became our little inside joke and what better time to finally make it from scratch? Make the dough: Put flour and salt in a food processor, and scatter the cream cheese and butter chunks overtop. Pulse the machine 6-10 times, then process, scraping down the sides as necessary. Stop when the dough forms large curds. Turn the dough out, gather it into a ball, divide it in two, and form them each piece into a small disk. Refrigerate each half in plastic wrap for at least two hours and up to one day. Make the filling: Heat the jam in a small bowl in the microwave for 1 minute, just until it liquefies. Mix the cinnamon and sugar together and set aside. Line two baking sheets with parchment or silicone. In a clean food processor, add the chocolate chips and almonds. Process until the mixture breaks down into a course crumb or powder. Remove from food processor and set aside. Shape the cookies: Take one disk of dough from the refrigerator. If it’s too cold or stiff to roll, leave it out at room temperature for ten minutes. On a lightly floured surface, roll the dough into an 11-12 inch circle. Spoon a thin gloss of warmed jam overtop, and sprinkle half of the cinnamon sugar mixture. Using a pizza wheel or sharp knife, slice the dough into quarters, and slice each of the quarters into four long, narrow triangles. Carefully scatter over half of the chocolate/nut crumb mixture over the cut slices. Starting at the outside rim of each triangle (the base), roll each triangle up so that it becomes a little crescent. Make sure points are tucked under the cookie, and arrange on a baking sheet. Repeat with the second packet of dough. Refrigerate rugelach for at least 30 minutes before baking. Position racks to divide oven into thirds, and preheat to 350 degrees. Stir the egg and water together, and brush a bit of this glaze over the rugelach. Sprinkle each with coarse sugar. Bake for 20-25 minutes, rotating sheets from top to bottom and front to back half way through. Jam will likely have leaked out, so it’s best to scoop underneath each cookie within a minute of removing them from the oven, so that they don’t stick to the tray. You are one lucky lady. Happy 5 years to you both! Happy anniversary! 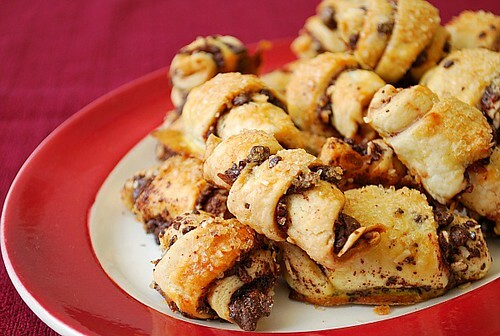 I don't believe I've ever had rugelach, looks amazing! What a great treat for a special day! I have never tried Rugelach, so I must!